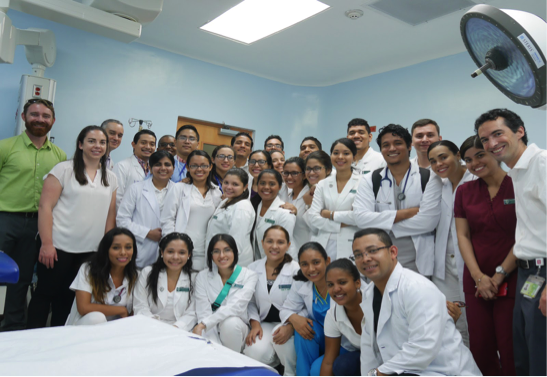 In June 2017, Panamanian medical students participated in the “Introduction to Emergency Medicine: Tools for the Medical Frontline” course taught by Dr. Martin Musi, Dr. Julia Dixon and Joel Vaughan, EMT, all staff at the University of Colorado. The course was developed in collaboration with and sponsored by the Universidad de Panamá, Facultad de Medicina (School of Medicine). Medical training in Panama consists of 6 years of undergraduate medical school, followed by a required two years of clinical work. The first year is typically at one of the large hospitals on different rotations followed by one year in more rural communities. After this, they may pursue specialty training. Currently, medical students have limited training in emergency medicine, yet most will spend one of their post grad years in a setting that requires they be adept at recognizing and treating emergency conditions. The weeklong course emphasized a multidisciplinary team approach to management of emergencies. Students participated in lectures, workshops, procedures labs, and simulation-case scenarios that covered topics in trauma, medical, pediatric and obstetric emergencies. The Facultad de Medicina has several high fidelity simulators where small groups of students practiced assessing and treating patients with a variety of conditions. Once acclimated, Dr. Dixon notes, the students thrived in this learning environment. The final simulation scenarios took place in the Emergency Department of the teaching hospital, and included residents from the EM Panamanian Residency to round out the realistic team-based approach.